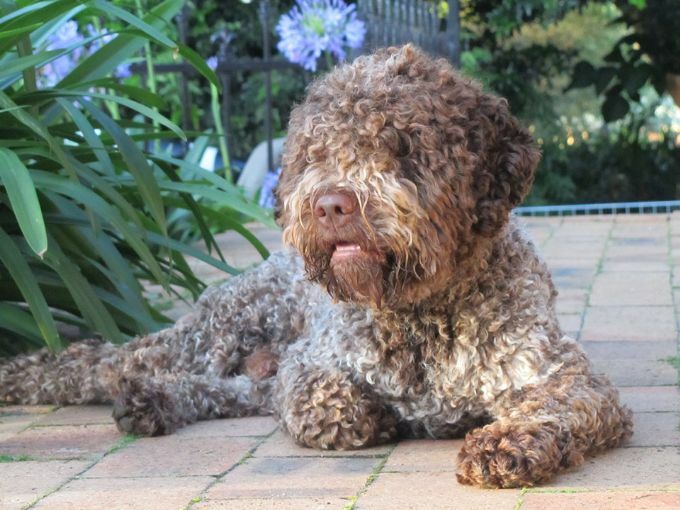 Lagotto Romagnolo are an ancient, curly-haired water dog from Italy, dating back to the 1600's. They are the only officially recognized truffle searching dogs. Lagotto are an intelligent, easy-going and affectionate dog. They are very devoted to their owners and easy to train, making them an excellent companion dog. They can be quite active as puppies and generally mature into sensible, calm adults by around 18 months to 2 years. Young Lagotto love to chew and dig and can be worn out with short walks and games that challenge them mentally. Early socialisation is an important part of raising a Lagotto. Bearing in mind that Lagotto are working dogs, adults also require mental stimulation and physical activity a couple of times a day. They will generally be happy to laze around in between times. There are variations in individuals and some are more active than others. Lagotto enjoy being with you and pleasing you. This makes them very suitable for obedience training, and dog sports such as flyball and agility. Nosework and tracking are also great. Many love the water, so swimming, dock diving, and retrieval from the water are perfect. The Lagotto coat can be a solid colour, roan, or have patches of a different colour. The basic colours are orange, off-white, brown, and roan. There could be brown with white, white with brown, white with orange etc. Noses are always brown. Eyes range in colour and can be hazel, amber, or dark brown and any other shade in between. Black is not an accepted coat colour. Males should be 43cm to 48cm at the shoulder and weigh 13kg to 16kg. Females are slightly smaller and should be 41cm to 46cm at the shoulder, and weigh 11kg to 14kg.